This rare and interesting name of medieval English origin, found mainly in the West country is topographical for the dwelling, or dairy farm of the "herd" or keeper of cattle. The derivation is from the Old English pre 7th Century "heord(e)" a herd, with "wic", a dairy farm, as the suffix "idge" or "itch" is a variant of "wic". 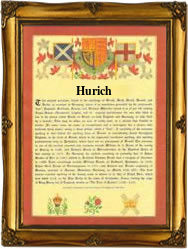 In its present form this surname is a dialectal variant of "Hurditch", others being, Hurdedge, Hardage, Hurich(e). The following examples illustrate the name development, John Hurdich (1327 Kirby's Quest, Somerset), William Hurdwyche (1327, Somerset), Robert Hurdiche married Edith Bendle on July 18th 1614 at Wraxall, near Bristol, Somerset, and Hester Hurditch married Richard Petherick on April 10th 1798, at Highweek, Devon. The first recorded spelling of the family name is shown to be that of John Hurditch (witness), which was dated February 15th 1583, at Christon, Somerset, during the reign of Queen Elizabeth 1, known as "Good Queen Bess", 1558 - 1603. Surnames became necessary when governments introduced personal taxation. In England this was known as Poll Tax. Throughout the centuries, surnames in every country have continued to "develop" often leading to astonishing variants of the original spelling.